Citation Information: J Clin Invest. 2004;113(3):370-378. https://doi.org/10.1172/JCI19670. Mutations in the lamin A/C gene (LMNA) cause a variety of human diseases including Emery-Dreifuss muscular dystrophy, dilated cardiomyopathy, and Hutchinson-Gilford progeria syndrome. The tissue-specific effects of lamin mutations are unclear, in part because the function of lamin A/C is incompletely defined, but the many muscle-specific phenotypes suggest that defective lamin A/C could increase cellular mechanical sensitivity. To investigate the role of lamin A/C in mechanotransduction, we subjected lamin A/C–deficient mouse embryo fibroblasts to mechanical strain and measured nuclear mechanical properties and strain-induced signaling. 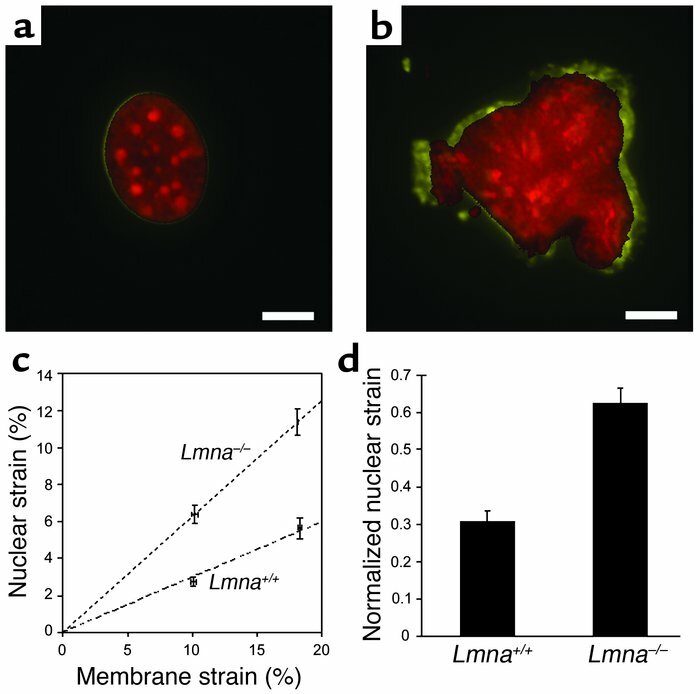 We found that Lmna–/– cells have increased nuclear deformation, defective mechanotransduction, and impaired viability under mechanical strain. NF-κB–regulated transcription in response to mechanical or cytokine stimulation was attenuated in Lmna–/– cells despite increased transcription factor binding. Lamin A/C deficiency is thus associated with both defective nuclear mechanics and impaired mechanically activated gene transcription. These findings suggest that the tissue-specific effects of lamin A/C mutations observed in the laminopathies may arise from varying degrees of impaired nuclear mechanics and transcriptional activation. Nuclear mechanics is impaired in lamin A/C–deficient cells. (a) Nucleus of WT fibroblast before strain (red) and at 22% strain (yellow). Scale bar: 10 μm. (b) Lmna–/– nucleus before strain (red) and at 19% strain (yellow). Scale bar: 10 μm. (c) Nuclear strain as a function of applied membrane strain. Dashed lines represent linear regression of the data for each cell type forced through the origin (Lmna+/+: y = 0.299x, Lmna–/–: y = 0.626x). (d) Maximal normalized nuclear strain was significantly increased in Lmna–/– fibroblasts (0.306 ± 0.029 vs. 0.626 ± 0.039; P < 0.0001, n = 21).